The attitude of a spacecraft is its orientation in space. This book is concerned with all aspects of spacecraft attitude—how it is determined, how it is controlled, and how its future motion is predicted. We describe simple procedures for estimating the attitude "and sophisticated methods used to obtain the maximum accuracy from a given set of data. In this chapter, we introduce the basic terminology and provide an overview of the attitude determination and control processes and their place in the overall space mission. The motion of a rigid spacecraft is specified by its position, velocity, attitude, and attitude motion. The first two quantities describe the translational motion of the center of mass of the spacecraft and are the subject of what is variously called celestial mechanics, orbit determination, or space navigation, depending on the aspect of the problem that is emphasized. The latter two quantities describe the rotational motion of the body of the spacecraft about the center of mass and are the subject of this book. Although knowledge of the spacecraft orbit frequently is required to perform attitude determination and control functions, the process of orbit determination or orbit maneuver analysis is outside the scope of this book. In general, orbit and attitude are interdependent. For example, in a low altitude Earth orbit, the attitude will affect the atmospheric drag which will affect the orbit; the orbit determines the spacecraft position which determines both the atmospheric density and the magnetic field strength which will, in turn, affect the attitude. However, we will normally ignore this dynamical coupling and assume that the time history of the spacecraft position is known and has been supplied by some process external to the attitude determination and control system. A brief summary of spacecraft orbit properties and terminology is given in Chapter 3. One distinction between orbit and attitude problems is in their historical development. Predicting the orbital motion of celestial objects is one of the oldest sciences and was the initial motivation for much of Newton's work. 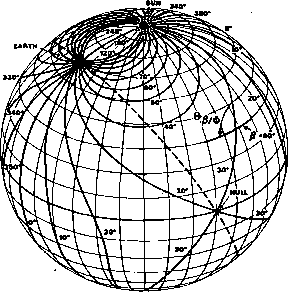 Thus, although the space age has brought with it vast new areas of orbit analysis, a large body of theory directly related to celestial mechanics has'existed for several centuries. In contrast, although some of the techniques are old, most of the advances in attitude determination and control have occurred since the launch of Sputnik on October 4, 1957. * The result of this is that relatively little information is recorded in books or other coordinated, comprehensive reference sources. The language of attitude determination and control is still evolving and many of the technical terms do not have universally accepted meanings. One purpose of this book is to codify the definitions of terms as they are commonly used and to eliminate some inconsistencies in their use. Attitude analysis may be divided into determination, prediction, and control. Attitude determination is the process of computing the orientation of the spacecraft relative to either an inertial reference or some object of interest, such as the Earth. This typically involves several types of sensors on each spacecraft and sophisticated data processing procedures. The accuracy limit is usually determined by a combination of processing procedures and spacecraft hardware. Attitude prediction is the process of forecasting the future orientation of the spacecraft by using dynamical models to extrapolate the attitude history. Here the limiting features are the knowledge of the applied and environmental torques and the accuracy of the mathematical model of spacecraft dynamics and hardware. Attitude control is the process of orienting the spacecraft in a specified, predetermined direction. It consists of two areas—attitude stabilization, which is the process of maintaining an existing orientation, and attitude maneuver control, which is the process of controlling the reorientation of the spacecraft from one attitude to another. The two areas are not totally distinct, however. For example, we speak of stabilizing a spacecraft with one axis toward the Earth, which implies a continuous change in its inertial orientation. The limiting factor for attitude control is typically the performance of the maneuver hardware and the control electronics, although with autonomous control systems, it may be the accuracy of orbit or attitude information. Some form of attitude determination and control is required for nearly all spacecraft. For engineering or flight-related functions, attitude determination is required only to provide a reference for control. Attitude control is required to avoid solar or atmospheric damage to sensitive components, to control heat dissipation, to point directional antennas and solar panels (for power generation), and to orient rockets used for orbit maneuvers. Typically, the attitude control accuracy necessary for engineering functions is on the order of 1 deg. Attitude requirements for the spacecraft payload are more varied and often more stringent than the engineering requirements. Payload requirements, such as telescope or antenna orientations, may involve attitude determination, attitude control, or both. Altitude constraints are most severe when they are the limiting factor in experimental accuracy or when it is desired to reduce the attitude uncertainty to a level such that it is not a factor in payload operation. These requirements may demand accuracy down to a fraction of an arc-second (1 arc-second equals 1/3600 deg). •No science is without antecedents. Much background in this area comes from attitude determination and control for earlier airplanes and rockets. In addition, it has been understood since Newton's time that the attitude of the Moon was probably "gravity-gradient stabilized," i.e., locked into its rotation period by the torque resulting from the tidal forces of the Earth on the Moon. A convenient method for categorizing spacecraft is the procedure by which they are stabilized. The simplest procedure is to spin the spacecraft. The angular momentum of a spin-stabilized spacecraft will remain approximately fixed in inertial space for extended periods, because external torques which affect it are extremely small in most cases. However, the rotational orientation of the spacecraft about the spin axis is not controlled in such a system. If the orientation of three mutually perpendicular spacecraft axes must be controlled, then the spacecraft is three-axis stabilized. In this case, some form of active control is usually required because environmental torques, although small, will normally cause the spacecraft orientation to drift slowly. (However, environmental torques can be stabilizing in some circumstances.) Three-axis stabilized spacecraft may be either nonspinning (fixed in inertial space) or fixed relative to a possibly rotating reference frame, as occurs for an Earth satellite which maintains one face toward the Earth and therefore is spinning at one rotation per orbit. Many missions consist of some phases in which the spacecraft is spin stabilized and some phases in which it is three-axis stabilized. Some spacecraft have multiple components, some of which are spinning and some of which are three-axis stabilized. In this section we describe the profile of a typical space mission to illustrate the attitude determination and control process and to relate this process to the overall mission requirements. There is no single profile characteristic of all space missions. 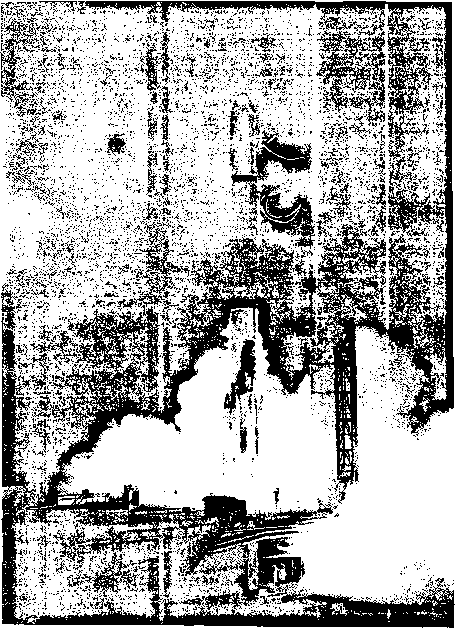 However, most missions have in common three more or less distinct phases: (1) launch, consisting of the activities from lift-off until the end of powered flight in a preliminary Earth orbit; (2) acquisition, consisting of orbit and attitude maneuvers and hardware checkout; and (3) mission operations, consisting of carrying out the normal activities for which the flight is intended. Launch is the most distinct and well-defined phase and is normally carried out and controlled primarily by personnel concerned with the rocket launch vehicle and who will not be involved in subsequent mission operations. A limited number of launch vehicles are in use. For the United States, these range from the four-stage Scout, which is capable of orbiting a payload of about 100 kg to the three-stage Saturn V, capable of putting 100,000 kg in low-Earth orbit. (See, for example, Glasstone , vonBraun and Ordway , or the excellent nontechnical book by Clarke .) One of the most common launch vehicles for Earth-orbiting spacecraft is the Delta, which has launched over 100 spacecraft and has low-orbit payload capabilities of 240 kg to 1900 kg, depending on the rocket configuration. For future launches, the Space Shuttle will be the most common, though not exclusive, vehicle. Once powered flight has ended and the spacecraft has separated from most of the launch vehicle, the acquisition phase of maneuvers and testing begins. (The final launch stage may be left attached to the spacecraft for later maneuvers using the final stage control hardware and fuel. An Agena upper stage, a rocket which may be restarted in space, is frequently used for such maneuvers.) The acquisition phase can last from a few minutes to several months and may be defined differently depending on the particular aspect of the mission that is involved. For example, for someone concerned primarily with the operation of communications hardware, testing and maneuvering may last only a brief period, with "normal" operations beginning well before experiments or operational equipment have been thoroughly tested. Normally, the major portion of the attitude analysis for any mission is concerned with various aspects of the acquisition phase, as described in the example below. Finally, once the proper orbit and attitude have been obtained and the hardware has been tested, the mission operations phase, in which the spacecraft carries out its basic purpose, is initiated. At this stage, attitude determination and control becomes, or should become, a routine process. On complex missions, such as lunar or planetary explorations, the acquisition phase may be repeated at various intervals as new hardware or new conditions are introduced. 'Occasionally, U.S. spacecraft are launched from non-American sites. For example, the Small Astronomy Satellite-1 (SA&l), also called Uhuru after the Swahili word for freedom, was launched from the Italian San Marco Platform, similar to an oil exploration platform, off the coast of Kenya. This was done to avoid the van Allen radiation belts. *See Section 1.4 for an explanation of "UT" or Universal Time.